Yes as the unofficial club photographer (TM Peter West) I’ve come to the conclusion we should ban photography at all future meetings of First Oakville Toastmasters. Why? 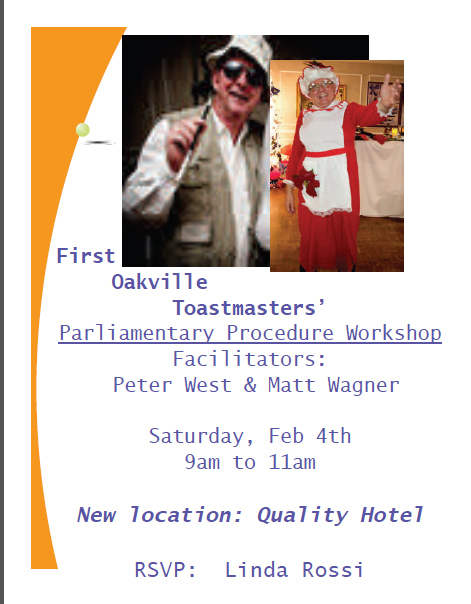 Because how can either TM Matt Wagner or myself garner any respect as the facilitators for the Parliamentary Procedure on Saturday February 4th at the Quality Inn Hotel on Bronte Road from 9am to 11am after seeing us dressed as we are in the poster? This is outrageous. Here’s Matt cross-dressing as Ms Santa Claus at our fabulous club Christmas Party and that’s me as gonzo journalist Hunter S. Thompson at our Hallowe’en Party. 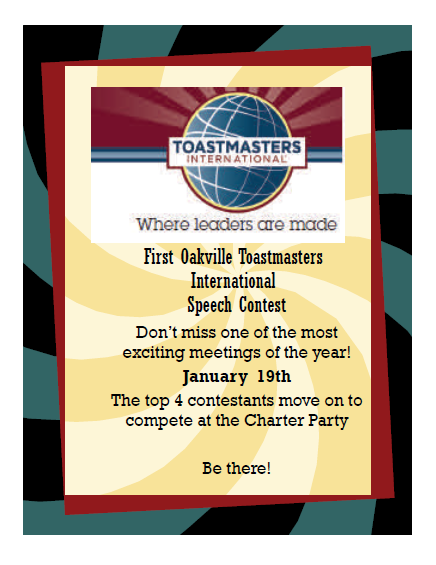 Tonight is the first round of First Oakville Toastmaster’s International Speech Contest. A contest night is a special time especially at First Oakville. Tonight we get to hear from some of our most courageous speakers who are putting themselves into a competition that can lead to the World Championship of Public Speaking. This is a huge challenge and it’s not too late to get involved in two ways. First, you can still register as a competitor. Toastmaster rules state that you can throw your hat into the ring anytime before the contest chair is formally introduced to the audience. But, you might say I haven’t practiced my speech enough. Folks there’s no reason why you can read your speech from the lectern. You’re not likely to win but you stand a pretty fair chance at placing. If you place, you’ve got time to practice before the Charter Party (Which everyone should attend. It’s not only the social highlight of the year but a great party and celebration of Toastmasters.). But even if you’re not competing there’s a second way to get involved. Our speakers need the best audience we can create. Not only that, our speakers will appreciate any suggestions you might offer to them after the meeting. If you are a mentor and one of your mentees is speaking you really should offer your thoughts on how to improve and to provide a support face in the crowd. Besides if you attend the contest tonight, you just might find the courage to compete next year. Last night’s theme was ‘Taking Risks’—urging us to venture out of our own “box”. An excellent topic, thanks to our chair, Val Clements, to start off our new year! It got me thinking about who or what helped me step out of my box in 2011. My mentor! I would like to suggest that we all venture out a little farther with our mentoring relationships in this last half of the Toastmaster year and see where it takes us. There is a wealth of knowledge in our club—waiting to be tapped if only we have the courage to ask for the help. With the guidance of my mentor, I have grown in areas that I didn’t expect. I thought I would become more technically proficient—such as where to strengthen my content or delivery. And my mentor has assisted me with that for sure. For example, one area where I think many of us miss the boat, including me, is matching our speech to our project goals. I have seen some great speeches but unfortunately, they were not conducive to the purpose of the project—like vocal variety or body language. A mentor can bring that to our attention. For me, the most surprising benefit of having a Toastmaster mentor, has been that he challenges me to be more courageous in my speeches—making me step out of my ‘box’ and get comfortable with the uncomfortable. I found this can be a humbling but worthwhile experience, as the payback is always a better end product that boosts my self-confidence as a speaker. I challenge each of us to invest more of ourselves in our mentee / mentor relationships this year. And don’t be afraid to ask for it—mentors love the challenge and will grow from the experience just as much as the mentees! Take a risk and venture out of your box!